Training and Training Rooms Available! NEC Display Solutions has launched a 65-inch digital signage display to deliver touchscreen capabilities for digital signage and video wall applications in corporate, education, retail and restaurant environments. It will sell through its reseller networks, and CCS Presentation Systems will be your local business contact. Eat at either UNO location in Nashua, NH to support Hudson NH Public Schools! With your support, you give the lucky school a chance to win a FREE SMART Board and make learning fun! NASHUA — Additional employees, a newly renovated building and a strong customer service ethic has helped a local business succeed despite tough economic times. 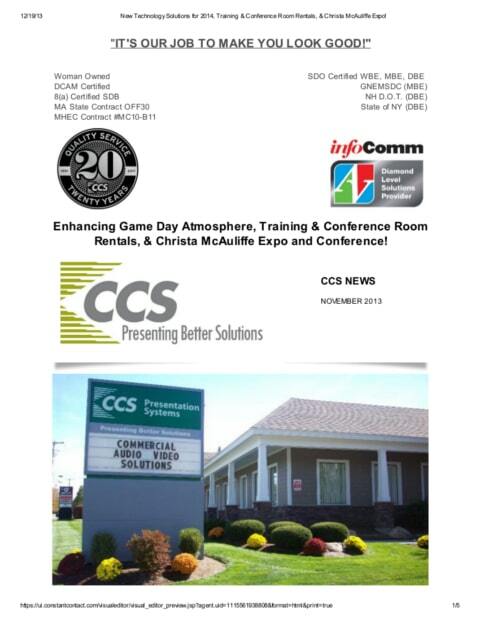 CCS New England, one of the largest audio and visual integrators in the nation, moved its regional headquarters from Chelmsford, Mass., to the Gate City in 2010. CCS New England is pleased to announce we are a new member of the Greater Nashua Chamber of Commerce. In September, we officially became a part of the Chamber and will be working with them in the coming months on some exciting initiatives for the Nashua, New Hampshire and Massachusetts areas. Every company’s dream is to use its existing business to create a different business. 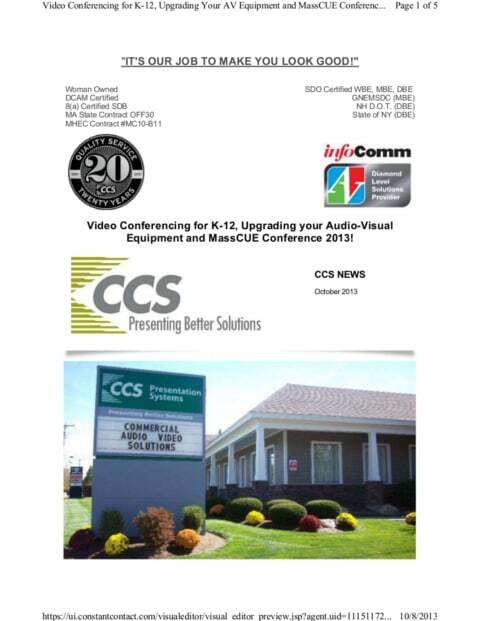 As it turns 15, the Nashua audio-visual company CCS Presentation Systems might have done just that.